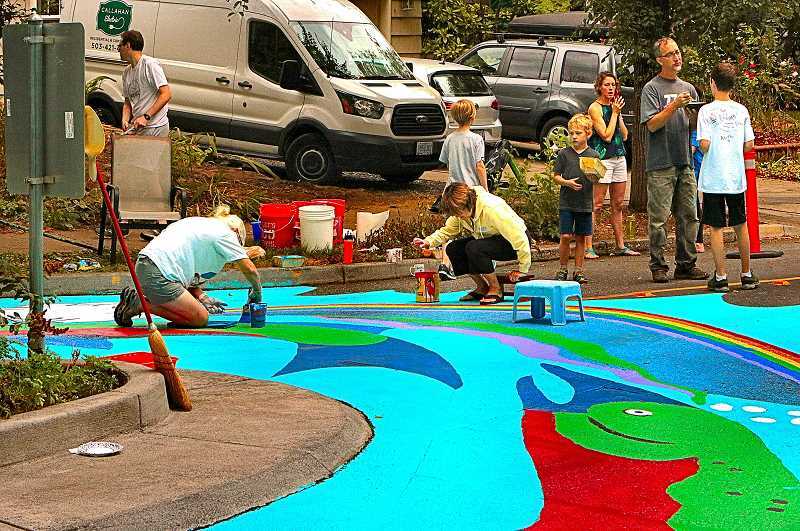 Since Eastmoreland neighbors first created a street mural in 2012 in the "Bybee Circle" along Bybee Boulevard – where S.E. 37th Avenue would cross if the street were improved – they've held an annual block party to celebrate the community street mural. "We also get together to refresh our mural, which symbolizes Portland – with [elements of] Mt. Hood, salmon going up and down the river, our environment, and how much we care about keeping things beautiful here," explained artist Collin Murphy at this year's outing, held on Saturday, August 11. Murphy also hopes that keeping the street mural neatly painted with vivid colors has the effect of slowing down the traffic that "comes charging down the street" from S.E. Chavez Boulevard (formerly 39th), Murphy said. "We haven't made many changes; we have added features and other things," Murphy told THE BEE. "For example, we've extended some of the waves to the bottom, because the little kids were painting it and they got carried away! And, it looks like a big wave of blue "water" splashed along the curbs." As many as forty Eastmorealnd families support the project, she said, and contributions pay for the paint and supplies. "This is a great group of neighbors that gets together for an annual street party and potluck; we all care about each other, and this annual gathering helps us be better neighbors," Murphy reflected. "And, for one day of the year, kids can spend the afternoon playing in our traffic circle without worry about traffic on this busy street!"